When I was little I used to wonder if my Uncle Homer was Dr. Seuss. 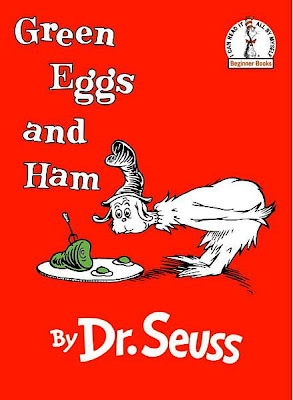 I suppose it was the last name of Eggers and the whole green eggs and ham reference, but, it was probably a little bit due to the fact that Uncle Homer was just as I imagined Dr. Seuss would be like: kind, loving, funny, interested in kids as if we were real people, and plenty goofy when the situation called for it. Now, that I am old enough to know better, I still suspect that Uncle Homer was an even better Dr. Seuss than the real one. When I went to family reunions I would always look for Uncle Homer. Now don't get me wrong, I loved my pastor uncles and wonderful aunts; I admired their vocabularies, their discussions, and many accomplishments but, you see, Uncle Homer was interested in me. He would put his hand on my shoulder and ask me. . .really ask me, how I was doing. Because of the wonders of Grace and Homer, I very much wanted to be like their children, Tom, Susan and Nancy, when I grew up. I hope I am, at least a little bit. When I think of Uncle Homer and Aunt Grace I am reminded of a particular characteristic: humility. Homer and Grace did not boast. This was not a surprise because those of us who teach know that the people who brag are usually the ones who are least secure. They feel the need to remind people of their importance. They worry they might be deemed insignificant if others aren't hearing about them or imitating them. No, Homer and Grace did not boast. Still, they didn't put themselves down, either. The folks who criticize themselves in front of others aren't any more humble than the people who boast. It doesn't really matter if you are bragging or dragging, you are still thinking about yourself. Homer and Grace showed humility because they didn't feel the need to be thinking about themselves. They were too busy thinking about others. They were too busy loving others. They were too busy doing the work God set before them. In this way they showed us what it means to be a servant. A few days ago, Jesus came, put his hand on Homer's shoulder and took him home to heaven. I am imagining him holding Grace's hand and looking into the eyes of his Savior. I know that both Homer and Grace went to heaven very proud of their children. I know both Homer and Grace will be missed. And, because of their humility and love, I know my Savior's love a little bit better.